Jeff Nappi, Director, Technology at iAcquire has recently blogged about their use of heavy use Ubuntu and open source software across the enterprise. Its a wonderful read, I will quote some of the parts from the article here. iAcquire specializes in digital marketing services and their fulfillment department has 45 happy Ubuntu users. The single largest department at iAcquire is our fulfillment team and they currently work every day on dual-head Ubuntu 10.04 LTSP diskless workstations. These diskless workstations are what are known as Fat Clients – the entire operating system is loaded via a compressed disk image over our Gigabit LAN, authentication is done via SSH, and home directories are mounted via NFS. All applications are run locally and are very fast – it is nearly unnoticeable that the machine is running entirely over the network. Behind the scenes we have two powerful servers in a hot-standby configuration that serve these diskless clients. Jeff cites a number of benefits like no virus threats and hardware failures, easy availability of software and no IT support time and cost. They use popular Linux applications like Firefox, Thunderbird, Google Chrome, LibreOffice, Pidgin Instant Messenger and Spotify. To date we have saved hundreds of thousands of dollars in unnecessary costs by choosing Linux and open-source platforms. 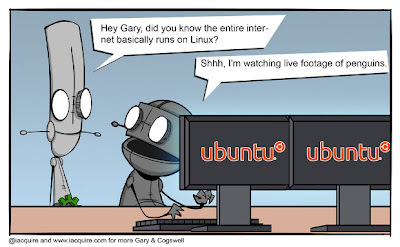 Many iAcquire developers are currently using Ubuntu 12.04 on desktops and soon many workstations will be upgraded to Precise. 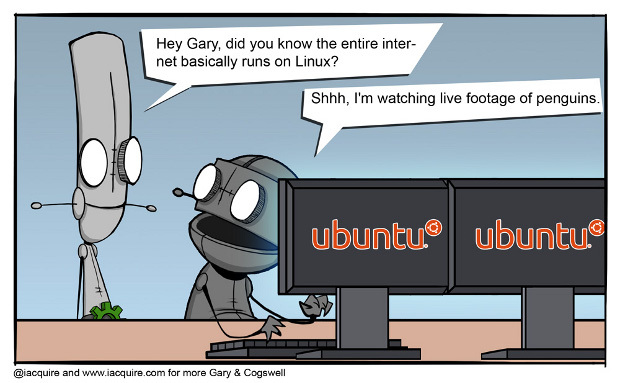 Several of the iAcquire developers are currently using Ubuntu 12.04 / Precise Pangolin on our desktops – including myself. And we really love it, it’s an extremely good user experience. Unfortunately we’re not yet able to share the awesome experience of Precise with the fulfillment team due to several squirrels (aka bugs) that are preventing us from deploying it. We will be doing more testing over the coming months and plan to share this experience with the rest of the iAcquire team as soon as we can.